Viking Ocean Cruises' fifth ship, Viking Orion, was christened yesterday in the Italian port of Livorno by its godmother, former NASA astronaut Dr. Anna Fisher. The 47,800-ton ship was named Orion in recognition of her work on the NASA's Orion exploration vehicle project. There was also a surprise onboard in connection with her work in space. The complete story appeared in the June 15 edition of Cruise News Daily. Windstar has more than 450 sailing currently open for sale. They visit 299 ports of call in 79 countries. And now more than 45% of those itineraries feature late night stays (until 10pm or later) or overnight calls. Some even stay two nights. Details appeared in the June 15 edition of Cruise News Daily. Royal Caribbean Cruises Ltd (the parent of Royal Caribbean International) said today they have purchased a 66.7% stake in Silversea Cruises for approximately $1 billion. In addition Manfredi Lefebvre will receive approximately 472,000 Royal Caribbean shares if certain performance metrics are met. The complete story appeared in the June 14 edition of Cruise News Daily. Triple-Header at Saint-Nazaire & an Announcement! MSC was busy at the STX France yard in Saint-Nazaire today with three major events and an announcement of yet another ship order. Normally, any one of the events would have been newsworthy by itself, but today, MSC grouped them for a super event. 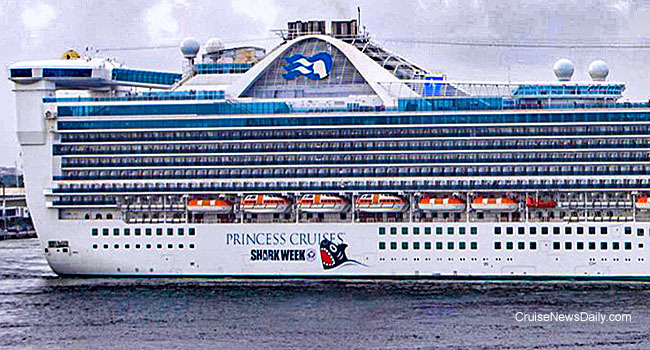 To let everyone know that the “Summer of Shark” is in full swing aboard, Princess had a decal made up for Caribbean Princess, and it went on the ship last weekend. Details appeared in the June 14 edition of Cruise News Daily. Last summer Oprah Winfrey went on her first cruise ever, and she took along a whole boatload of fans on Eurodam to Alaska. She liked it so well, she's scheduled a “Girls' Getaway” three-night cruise to the Bahamas aboard Nieuw Statendam in January. One other bit of news: Holland America said that Oprah will be the godmother of Nieuw Statendam and christen the ship at a later date. The complete story appeared in the June 13 edition of Cruise News Daily. Spectrum of the Seas, the first of Royal Caribbean's Quantum Ultra Class ships, is about a year away from entering service in China, and the line is ready to start talking about new features which will debut aboard Spectrum, and likely will then find their way onto other RCI ships. The ship is currently under construction at Meyer Werft in Papenburg (Germany), and when we last talked about it at the beginning of the month, it was to look at Meyer's construction method for larger vessels, and a section of Spectrum has just been floated out. The complete story appeared in the June 12 edition of Cruise News Daily. MSC christenings are always spectacular events filled with personalities arriving on the blue carpet - notables connected with the ship and MSC executives - sparkling entertainment, pageantry and the highlight moment when Sophia Loren cuts the ribbon that breaks the bottle christening the new ship. The evening is always capped by a glittering fireworks display. Saturday night's celebration of MSC Seaview was no exception. The complete story appeared in the June 11 edition of Cruise News Daily. Ritz-Carlton's cruise brand, Ritz-Carlton Yacht Collection, opened reservations today for the first time worldwide. The program includes the entire first year of cruises that include the Mediterranean, Northern Europe, the Caribbean, Latin America, Canada and New England. The intimate size is going to take the vessels into ports where typically larger cruise ships can't go, such as Portofino, Capri, and Mykonos. The first of three ships now enters service in February 2020. Details appeared in the June 11 edition of Cruise News Daily.